Create – Create is a vibrant environment centre which hosts a range of events and exhibitions. Create is a vibrant environment centre which hosts a range of events and exhibitions. Create is a vibrant environment centre which hosts a range of events and exhibitions and features a purpose-built Ecohome . The centre is a great venue for meetings, seminars and conferences as well as providing flexible workspace to several environmental organisations. Create is owned and managed by Bristol City Council. We’re committed to improving the local environment and helping to protect it for the future. Read our Environmental Policy (pdf, 309k) . This policy shows our commitment to reducing our environmental impacts. Create is pleased to support Bristol Green Capital – working towards making Bristol a low-carbon city with a high quality of life. To view Bristol City Council’s Environment Policy click here. 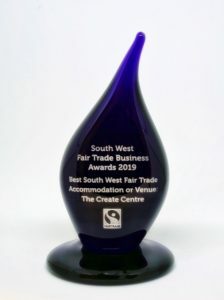 Our small team of four have been entering the South West Fairtrade Business awards since we started seven years ago. From 2014 to 2017 we have come away with the gold award for either best Fairtrade office or best Fairtrade accommodation or conference centre. We have managed to achieve this through our continuous work promoting and supporting Fairtrade, which we do by running promotional events, tasting sessions, quizzes and by, where ever possible, only sourcing Fairtrade or Fairly traded goods for resale to our tenants and meeting room users. In 2018 and as announced early afternoon on the 8th of March 2019, The Create Centre has been awarded the Blue Glass Award for the best overall Accommodation or Conference centre in the South West. We won last year because of our awareness raising events and stocking of Fairtrade tea towels. This year because of our work including Fairtrade in our newsletter and making Fairtrade business packs to encourage more people and businesses to choose Fairtrade. Every member of our team works to promote Fairtrade and the incredible things they do to support farmers and workers across the supply chain and all over the world, we live in such an unequal and unfair world but Fairtrade is an organisation truly trying to change that. We would like to encourage more people to look at the different ways they can support Fairtrade and its goals, it is something most of us are aware of but not something that we all champion or look for when shopping. It’s time to make Trade Fair! The Create Centre has won another Gold award for Best Fairtrade Accommodation or Conference Centre at the Fairtrade Business Awards 2018. We were also the overall winner in the same category with the team picking up a beautiful Bristol Blue Glass trophy. The sixth annual South West Fairtrade Business Awards ceremony took place on Friday 9th March in the Bristol Brewery School – a hidden gem and a working brewey in the heart of Bristol. 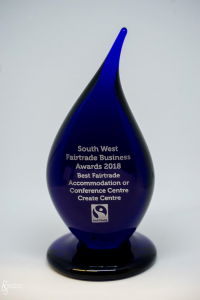 category at the 2017 South West Fairtrade Business Awards. Held, this year, at Bristol Cathedral, the event celebrates the region’s most active and dedicated Fairtrade organisations, and their achievements. We are very proud of our continued success at these awards. Fairtrade is very important to Create, we’ll always be looking at more ways in which we can spread awareness and educate. The Create Centre has won two Gold awards at the 2016 Fairtrade Business Awards ceremony. The centre was awarded Gold for Best Fairtrade Office and Best Fairtrade Accommodation or Conference Centre. Create, which is also a Green Tourism Goldstar Award winner, is Bristol City Council’s flagship green venue. It offers flexible spaces for conferences, training, events and exhibitions and provides workspace to a cluster of 27 green and ethical businesses. One of the tenants, Café Create, which serves hot and cold food made from fresh locally sourced ingredients, was also awarded a Gold Fairtrade Business Award. The results were announced at a ceremony at the At-Bristol Science Centre hosted by ethical beauty and wellbeing expert Liz Earle MBE and was attended by 142 business leaders. The ceremony was the culmination of Fairtrade Fortnight celebrations in the region. It forms part of the Sit Down for Breakfast, Stand Up for Farmers campaign highlighting the fact that many farmers in developing countries provide food for us, but don’t get paid enough to feed their own families – an injustice Fairtrade seeks to redress. Businesses that use and sell Fairtrade products make a significant contribution to reducing poverty in developing countries and helping achieve the UN Sustainable Development Goals. Fairtrade also enables businesses to achieve transparency in supply chains, which is demanded by the Modern Slavery Act 2015. The 68 shortlisted businesses have between them spent nearly £500,000 on Fairtrade products, making a massive difference to the lives of producers in developing countries. The Fairtrade Business Awards are run by Business West, South West Fairtrade, Destination Bristol and Bristol City Council. Bristol’s flagship environment centre has struck gold once again. The multiple-award-winning Create Centre, which is owned and managed by Bristol City Council, is one of only four conference venues in the South West to boast gold status. As well as offering flexible spaces for conferences, training, events and exhibitions, Create is home to 27 green and ethical businesses. Create officers have worked closely with the council’s environment team to draw-up an action plan, complete with targets, to maintain gold status, with entrants being assessed every two years. 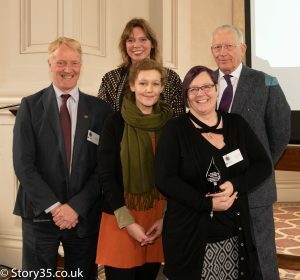 George Ferguson, Mayor of Bristol, said: “Another month and another gold award for the Create Centre, which is, of course, more good news for Bristol. “The Create Centre is a one of many jewels in Bristol’s crown and it’s setting the gold standard when it comes to sustainable living and working. Councillor Daniella Radice, Assistant Mayor for the Environment, added: “I’m delighted the Create Centre has maintained its Green Tourism Gold status, and my congratulations and thanks go to the team for their efforts. Michelle Scoplin, Senior Create Officer, said: “We think the scheme has a very positive impact on Create. The preparation for the audit, together with the advice from the assessor, encourages us to keep our green ethos at the very top of our agenda, and to constantly think about new ways we can become even more environmentally friendly. Bristol’s flagship environment centre has scooped a top Green Tourism award. The Create Centre, which is owned and managed by Bristol City Council, has won a Green Tourism Gold Star award in the best conference / events venue category. Senior Create officer Michelle Scoplin and Create officer Phil Tomlinson received the award on behalf of Bristol City Council at a special ceremony in Manchester on Monday (10 November). 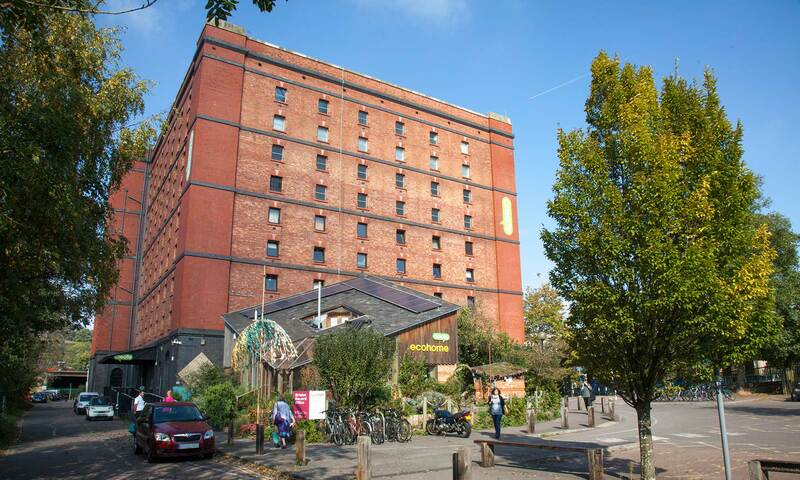 Mayor of Bristol, George Ferguson, said: “The Create Centre remains a key driving force in the city’s continued and growing reputation as a place where environmental change remains a central focus. “Winning this award is great news, particularly in the lead up to Bristol 2015 European Green Capital, and I thank the Create Centre team for all of their efforts. Bristol City Council uses a European Eco Management and Audit Scheme (EMAS) to drive environmental improvements across all of its services. Create is part of the corporate EMAS certificate. Joint work by the EMAS team and Energy Service led to improved environmental performance, including reduced energy/carbon intensity, from 1.24 tonnes of CO2 per tenant in 2010/11 to 0.64 tonnes in 2013/14. Water consumption in this period also significantly reduced from 9m 3 to 5m3 per tenant. Assistant Mayor for the Environment, Councillor Gus Hoyt, said: “The Create Centre is an excellent example of what we are doing to make real environmental improvements across all council services. They are indeed a deserving winner of this accolade. The Green Tourism Gold Star award honours businesses and organisations, which have done the most to promote sustainability within the industry. This includes cost-saving practices that help the environment, while improving customer service. The Gold Star award is only open to organisations which already have the Green Tourism Gold award. This meant the Create Centre saw off competition from a shortlist of top performing businesses. All of these businesses were assessed for their innovation, cost savings and green ambassadorship during 2013/14.